MINNEAPOLIS (AP) — The Minnesota Twins’ offense managed just enough to back Michael Pineda through his tough outing. Pineda labored through six innings and Eddie Rosario drove in two runs as Minnesota had just five singles in 4-3 win over the Detroit Tigers on Saturday. The Twins entered the game with 26 walks, the fewest in the majors, but drew seven against the Tigers. “I believe we went up there looking for good pitches to hit and when we had the opportunity to maybe take a few pitches and kind of draw that inning out … and we didn’t expand the zone,” manager Rocco Baldelli said. He was referencing when the Twins took a 4-2 lead in the third. Three of Minnesota’s first six hitters walked, and Byron Buxton and Jorge Polanco had RBI singles before Rosario lined a two-run single. “That was the difference in the ballgame — the two walks to start that inning, the four runs that came in,” said Detroit starter Tyson Ross (1-2), who allowed four earned runs and five hits in six innings. The first three Twins batters walked in the seventh. But after a couple strikeouts, Rosario hit a fly ball to the warning track in center. “That was a good swing but out. . The opportunity, 3-1, that’s my count,” Rosario said. “This is my focus . to give the opportunity to my team just winning the game. I’m working so hard in between starts for (going) to the mound every five days and give the opportunity for my team (to) win. That’s why I’m here, so I’m happy,” he said. Trevor Hildenberger and Taylor Rogers each pitched a scoreless inning, and Blake Parker got the last three outs for his third save. Detroit got some unexpected assistance to take a 2-0 lead in the third. 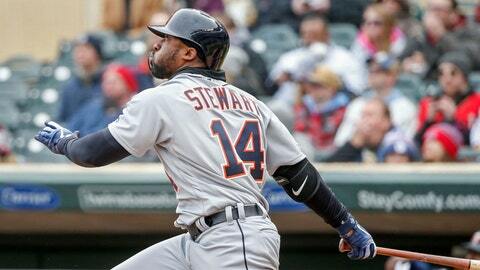 Christin Stewart hit his third homer of the year in the sixth. Detroit has an MLB-worst six home runs. Friday’s game was postponed due to weather. It marked Minnesota’s sixth off-day of the season that began March 28. Saturday was the first of 12 straight days with a game for the Twins, who’re scheduled to play 25 games in 26 days and 39 games in 41 days. Tigers: SS Jordy Mercer was placed on the 10-day disabled list after leaving the game with a right quad spasm. A corresponding move is to be made Sunday. … INF/OF Niko Goodrum sat out due to illness. … OF Nick Castellanos (sprained right big toe) probably won’t play this weekend, according to Gardenhire. Twins: 3B Miguel Sano took batting practice for the first time. Out with a right heel laceration sustained during a Dominican winter league playoff celebration Jan. 26, he is scheduled to go to Fort Myers in the middle of next week for a simulated Spring Training; however, he isn’t expected to play in a game for a couple weeks. … RHP Matt Magill (shoulder tendinitis) is scheduled to go to Triple-A Rochester Sunday and LHP Gabriel Moya (shoulder tendinitis) is likely headed to Double-A Pensacola Tuesday or Wednesday.